The chemistry industry plays an important role in world economy. Confronted with numerous challenges such as competition and innovation, they must constantly invest in research and development, reduce manufacturing costs and reduce their environmental footprint. Companies in the chemistry industry look for qualified suppliers of high quality, specialized equipment. Understanding the properties of polymers so they can be recycled and mixed with cement to create new concrete blends is just one example of how chemistry plays an important role between industry and environmental responsibility. Laval Lab has over 30 years of experience offering products and services to the chemistry industry. Our supplier base is extensive, comprising of manufacturers that set the standard in their domain. We offer a complete range of high quality laboratory testing and sample preparation equipment, including the crushers and grinders required for milling the sample and particle size and particle shape analysers. Laval Lab supplies the sample preparation equipment and the specialized chemical products required in preparing samples for XRF analysis. 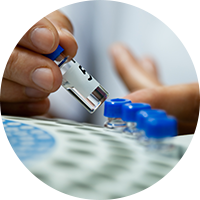 We offer instrumentation for quality control in the pharmaceutical, agrifood and chemistry industries, as well as a complete line of accessories and complementary products and services that might be required. Our representative offers technical support for the life of the instrument. Laval Lab understands the requirements and complexities in the chemistry industry. Our partnership with our suppliers, our knowledge of laboratory equipment available and our understanding of the criteria when choosing new equipment: installation requirements, easy to use, durability and quality for value over the long term. The Laval Lab representative is your resource for information during planning and purchasing, and their support continues during installation, training and after-sale service. We work together with our clients in the chemistry industry, to deliver quality solutions. Laval Lab with its long experience, expertise and vision of the industry can create effective solutions tailored to each situation taken into account. Laval Lab considers that only individuals trained and fully qualified can handle the product according to the actual regulations. Wide range of laboratory equipment, with cutting edge technology from world renowned manufacturers.